Archaeologists are manipulating sea levels to pinpoint ancient sites. The Discovery Islands are a big place. There are enough needles within this haystack of hundreds of islands off northeastern Vancouver Island to reveal to archaeologists much more than we currently know about British Columbia’s First Nations history, but finding them is challenging. This map showing what sea level would look like 29 meters higher than its modern height allows archaeologists to see where people may have chosen to live about 12,000 years ago. To find an archaeological site, researchers don’t simply dig holes until they start finding artifacts. Looking for sites is a complicated process combining maps, on-the-ground testing, observation, and intuition. The process may have just become a little simpler with the help of a technique usually used to assess the flooding risk from climate change. Lausanne’s research, done in collaboration with Hakai geographer Ian Walker and Hakai archaeologist Daryl Fedje, uses a mapping method called LiDAR (a remote sensing technology) to narrow down the search for sites. This technique gives her precise, 3D information about the terrain of the islands by stripping away the vegetation, but it’s what happens next that is truly fascinating. “I flood the models,” she explains. Ten thousand to 14,000 years ago, much of what is now the Discovery Islands was underwater, the weight of monstrous glaciers pushing the very bedrock below them into the Earth’s mantle during the last ice age. The result was a relative sea level up to 160 meters higher than it is today. After that weight was relieved, the land began to rebound, with sea levels appearing to fall relative to the land. 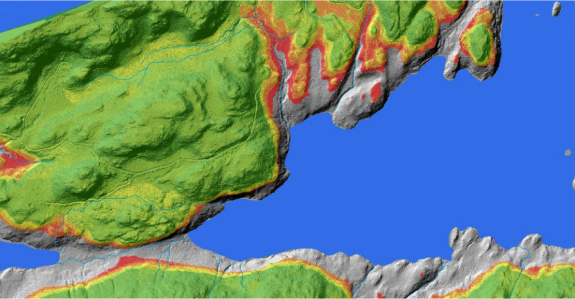 To approximate the historical sea level, Lausanne raises the sea level in her LiDAR models by 10 to 30 meters, and the remaining land—an archipelago of today’s hilltops—becomes more like the islands’ ancient landscape. Maps like this one take into account distance to the shore, flat ground, complexity, bays, and freshwater supplies to guess which areas would be most (red) and least (green) suitable for living in. 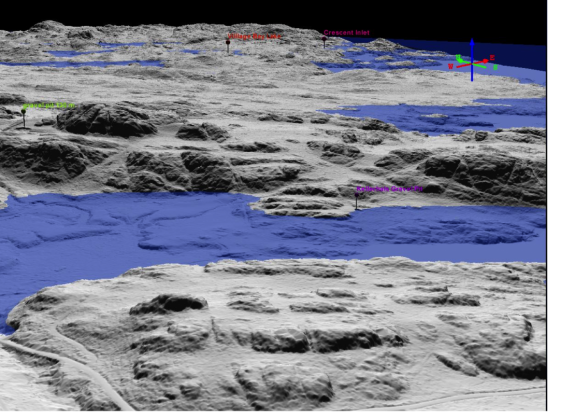 Eight of the 11 sites found this year on Quadra fell within the red area. It’s not as simple as just finding the old beaches, though. Other factors like shelter from wind and waves can help pinpoint where in the ancient landscape people may have preferred to live. This past summer, LIDAR helped Hakai and UVic archaeologists find eight previously undiscovered sites on Quadra Island. In the future, the team hopes to broaden the model to a larger geographical area and fine-tune the model. These are details that experienced archaeologists like Fedje and Quentin Mackie (a pair referred to as the “golden horseshoes” for their skill in finding sites) naturally incorporate into their own searches, but now this instinctual ability is presented in 3D for researchers to find sites more efficiently. “It’s about streamlining that thought process and making it more readily available for others to use,” says Lausanne. Narrowing the search is the first step to cataloguing the diversity of sites in the Discovery Islands. With more sites to work with, archaeologists will be able to paint a fuller picture of life on the BC coast. Sea level has changed almost everywhere in the world since the last ice age, so if it works here, this technique could be used to find ancient coastal sites all over the world.